More 20mph zones and lower speed limits | What Car? Plans to introduce more 20mph speed limit zones without the need for traffic-calming measures, such as speed humps, have been revealed. 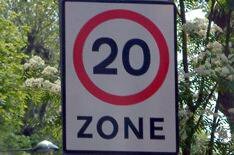 The Government is telling local councils to introduce 20mph schemes into residential streets and other roads where there's a high density of cyclists and pedestrians, such as around schools, shops and parks. Road safety minister Paul Clark said: 'We have seen that 20mph zones with traffic-calming measures can make a real difference to the safety of local roads. We've also looked at the latest research and listened to councils and residents who want to introduce 20mph limits on a series of roads where traffic-calming measures aren't possible or practical. The Government is repeating its call for councils to review speed limits on rural roads. Ministers want the national speed limit of 60mph lowered to 50mph on selected main roads in rural areas. A Department for Transport (DfT) statement said: 'Local authorities should consider reducing the limit on the most dangerous roads, where this will have a significant impact on casualties. These decisions remain entirely for local authorities to make based on their knowledge of local roads.